Bringing beer to a party? If you're going to take the time to hand-select your favorite craft beers, don't present your curated brew in anything but the best. Regular cardboard carriers rip, get soggy and are wasteful. A design company with a serious love of beer is hoping to remedy that with an environmentally friendly leather version. 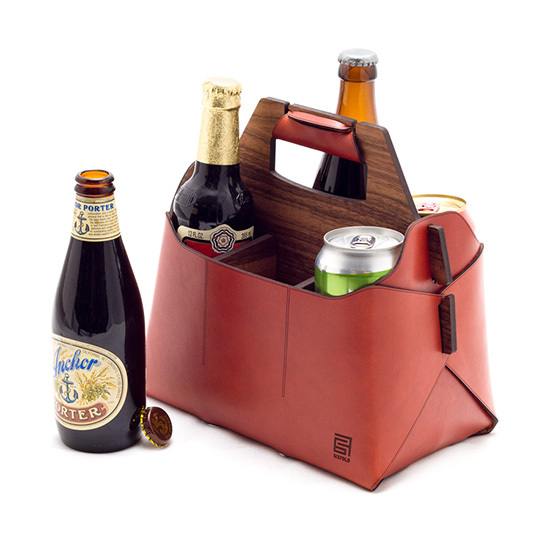 Sixfold's super-sleek beer caddy is a sort of build-your-own carrier that's laser-cut from sustainable, eco-friendly leather and walnut. Just unroll the leather, slide the walnut dividers together, fold the leather around the dividers and go. The patterns are then shipped to buyers, who can create their own carriers with six quick folds—no sewing or additional parts necessary. The idea for the design came about when founder Joshua Karl wanted to create a high-quality product without sewing. The fold-and-notch system he devised cuts down on extraneous production processes that often use toxic adhesives and industrial sewing machines. The company also aims to cut manufacturing costs and invest instead in the community and local materials, allowing "users to become makers!" Regardless, it is a better-looking and reusable way to carry your beer. With 24 days left to go, Sixfold's Kickstarter has raised nearly $6,500 of its $21,500 goal.